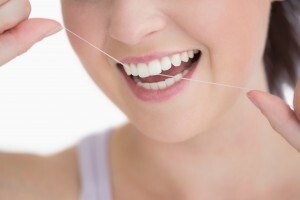 Flossing is just one way that you can maintain a beautiful smile! With the chill of winter, many of us are turning to hot beverages to help beat the cold. Hot drinks like coffee, tea, and hot chocolate are all perfect ways to warm up through the season, but they can also cause your teeth to become stained. Never fear, there are plenty of ways to enjoy your hot drinks without detracting from your smile! We all know that drinking water offers a ton of benefits to your body and health, and it can help save your teeth too! By making sure you’re alternating hot beverages with water you can help quickly wash away the staining residue of other drinks. Drinking a glass of water between mugs of tea or switching between sips of water and coffee can ensure that your smile and your hydration levels are in top shape. Ensuring that you remove any residue from your food and beverages is essential for your teeth year round, but especially when you’re drinking extra cups of coffee and tea. Brushing your teeth after your afternoon coffee break is a great way to prevent both stained teeth and the dreaded coffee breath. Having a spare toothbrush and tube of toothpaste in your office drawer or bag is an easy way to ensure excellent dental hygiene. Additionally, taking time to floss regularly will help reduce stains. As plaque builds up on teeth, it can cause stains to become more visible. By flossing after eating and as a part of your regular routine, you can help reduce the effects of plaque staining. Any time you reduce the contact of foods and liquids to your teeth the less likely you are to have stains. While drinking hot drinks with a straw is not always possible, it can help reduce the chances your teeth have to stain. Sometimes drinking hot beverages with a straw can result in burns so it may be best to leave the straw for iced tea and coffee instead. As dental technology has advanced, there have begun to be many new products available to the average consumer that help with bleaching and whitening. While these are never as successful as the treatments your doctor can provide, they can help minimize the effects of stains if you drink dark liquids frequently. This entry was posted on Friday, January 18th, 2019	at 12:26 pm	and is filed under Teeth Cleaning	. You can follow any responses to this entry through the RSS 2.0	feed. Both comments and pings are currently closed.